Do higher wages lead to more imports? 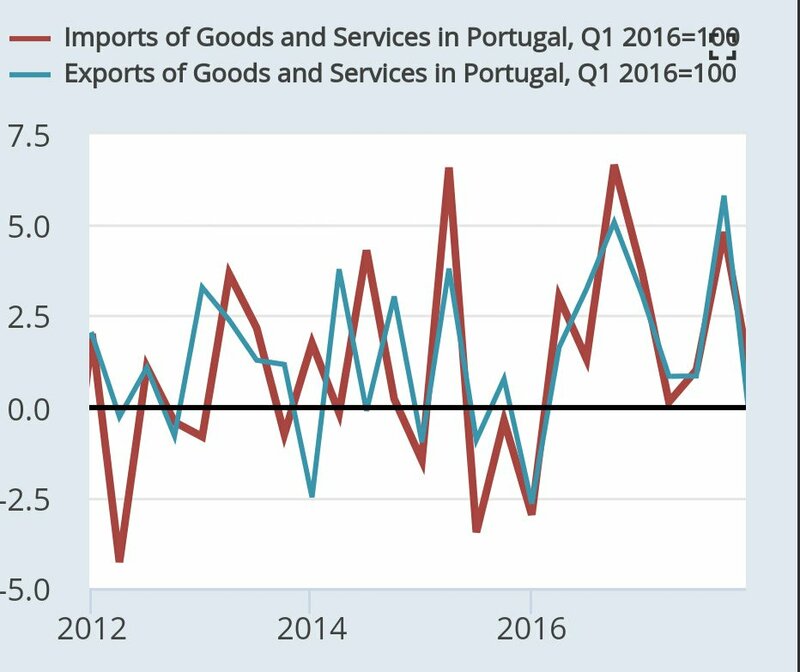 A recurring phenomenon that puzzles Portuguese economists and pundits alike is the increase of imports of foreign goods and services when a profligate Government is instated. 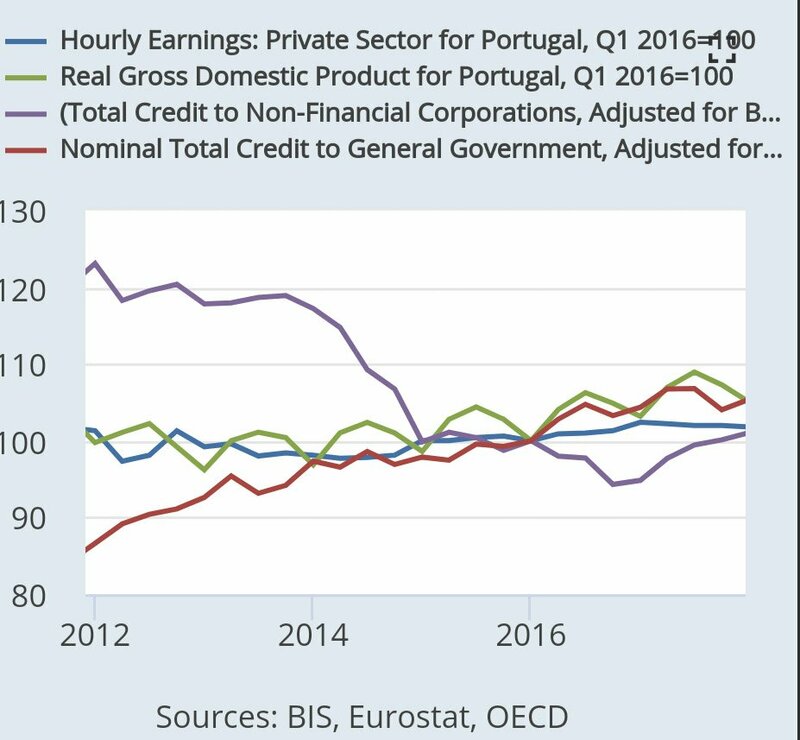 Whereas the puzzle could be easily explained away by Portugal’s relative advantage in mid-tech and low-tech goods (from machinery to artisanal products, where foreign value added is lowest) accompanied by generous spending modernising the country’s infrastructure, the most recent inversion from a current account surplus to a deficit further puzzles as Government spending lags economic growth. Literature on these matters is scarce as the link is typically established from the current account’s position (following Ricardo?) to the domestic economy, exploring effects known since Harrod, Balassa and Samuelson‘s or Podpiera‘s works; or explaining how wages could affect (or not) export competitiveness. Could it plausibly be that government profligacy stimulates imports? The ECB finds government signalling increases private investment at four-fold the rate it increases private consumption. We could say the real exchange rate is rapidly appreciating but wages are relatively stable from 2016. 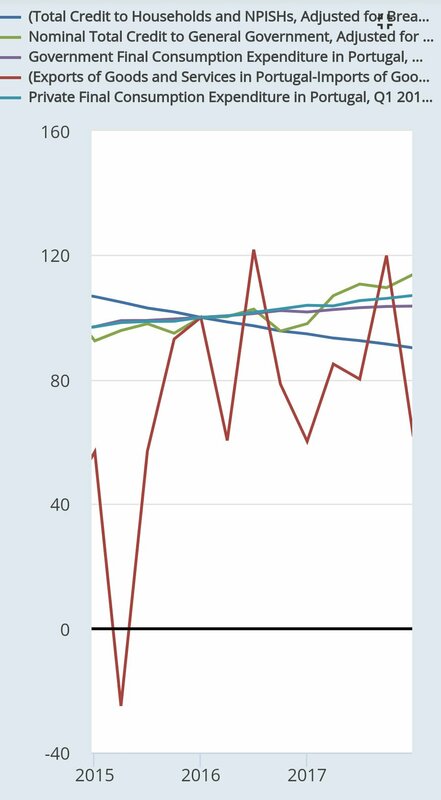 GDP grew faster in recent years when exports increased irrespective of wages although in several quarters a slower pace of wage growth compared with GDP may have induced competitiveness. Exchange rate appreciation is not what is happening today though as the widest gap between the levels of GDP and wages in the past half decade did not seem to decrease exports – quite the contrary, it is imports that increase. There are certainly numerous and more complete explanations of the phenomenon, including regulatory changes in export finance and port facilities. Government spending is known to significantly impact firm investment by crowding out lending to firms and consumers through higher interest rates – and yet, interbank rates decreased faster than Government borrowing costs (not plotted) while lending to the private economy picked up from recent years of deleveraging despite increased public borrowing. Whereas increased lending may be part of the equation, it certainly leaves plenty to be explained as a contraction in lending occurred concurrently with an upshot in imports. What could have happened though is a collapse of firm profits as wages increase above productivity. It is known that firms absorb expected higher wage costs by reducing profits. 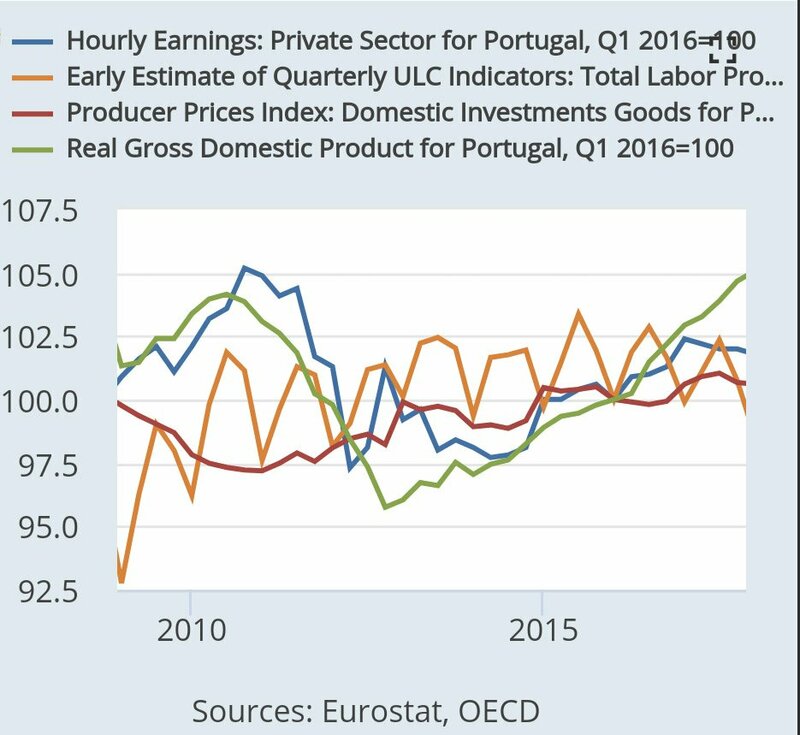 As firms rely on retained earnings to invest, less profits imply Portuguese innovation lags foreign competitors’ so that consumers may prefer foreign innovation while exports grow at a slower pace. The European Innovation Scoreboard finds Portuguese firms invest significantly in marketing innovation (although increasingly also on product and process innovation) as firms prefer deepening existing product categories to investing in longer-term product differentiation (the score on sales of new-to-market/firm innovations is amongst the lowest in Europe). Firms would lose competitiveness at home and abroad – and while only a proper statistical regression study could determine the accuracy of this model, statistical aggregates seem to show firm investment was negatively impacted by increasing labour costs above the pace of productivity. This (plausible) effect is more visible just before 2010 as the price index for domestic investment goods collapsed while the gap between productivity and earnings widened. 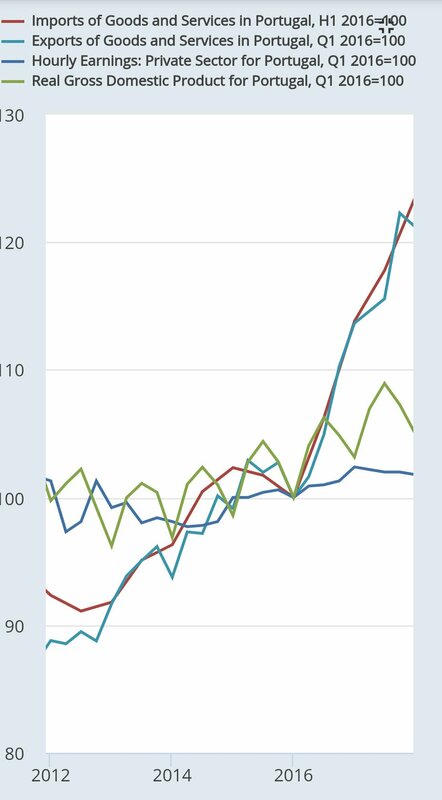 The index subsequently recovered as firms (plausibly) benefitted from gains in productivity above the pace of gains in earnings, higher profits and more competitive markets. As late as 2017, firms had yet to achieve such demand for investment even as GDP increased by 8pp in-between these years.